New Delhi Sep 15 (IANS) A little over Rs 1.5 lakh was raised to support a flood-ravaged Kerala in a sale of over 260 handwoven sarees. 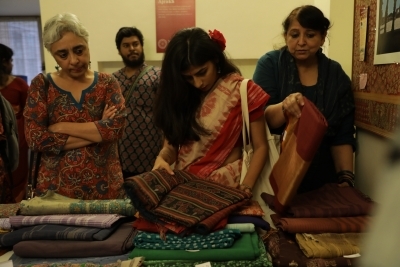 Organised by Sahapedia a digital encyclopaedia of Indian art culture and heritage the Annual Vintage Saree sale and auction took place between 5 p.m. and 7.30 p.m. on Friday. "Of over 260 sarees we managed to sell close to 230. The amount raised is a little over Rs 1.5 lakh " Sahapedia Projects Director Neha Paliwal told IANS over telephone. "The highest figure from a saree sale was Rs 10 500 which was in an auction that took place as well. The saree is an Andhra Ikat." she added. Most sarees in the sale were priced between Rs 200 and Rs 800 Sahapedia said. The amount raised will be donated to the Kerala Chief Minister s Distress Relief Fund. The state is reeling under the disastrous after effects of the floods that hit its many regions last month. The annual saree sale now in its third year aims to make India s vast cultural heritage more accessible to the common people Sahapedia had said in a previous statement.